This is a Renewal OSHA Annual Employee Training Package designed for our returning clients that want professional, PRIVATE guidance and interaction with our OSHA expert. This Go-to-Meeting™ webinar will be scheduled at a time of your choice where you can interact with our OHSA coach and get all of your questions answered during your session. Comprehension is enhanced and you will build rapport with your OSHA trainer who stays tied to your account throughout the year. 50-Minute Annual OSHA Employee Training Renewal Webinar session hosted via Go-to-Meeting ™ platform (A Downloadable Video Copy of your webinar available for $39 upon request. Please call us to order: 941-587-2864). 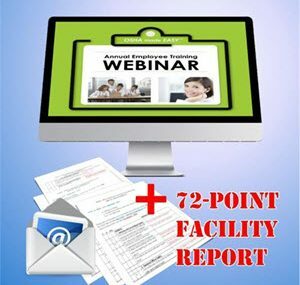 72-Point Facility Inspection & Report updated via a phone session appointment with your office’s key contact person. Report instantly emailed to your office. OSHA Expert On-Call (for 1-Full Year!) We continue to be an extended team member and your personal OSHA expert! Call us anytime with questions or if you need us to review inquiries from OSHA Inspectors. We’re there for you every step of the way.